CertainTeed’s exhibit showcases a new trend for exhibits that seamlessly integrate products. Trade show trends are ever evolving thanks to unique customer demands. Staying ahead of these trends can help you better reach your audience, while keeping you on-track to achieve your sales and marketing goals. At Nimlok, we stay close to the emerging trade show trends to ensure that our exhibitors are ahead of the curve. 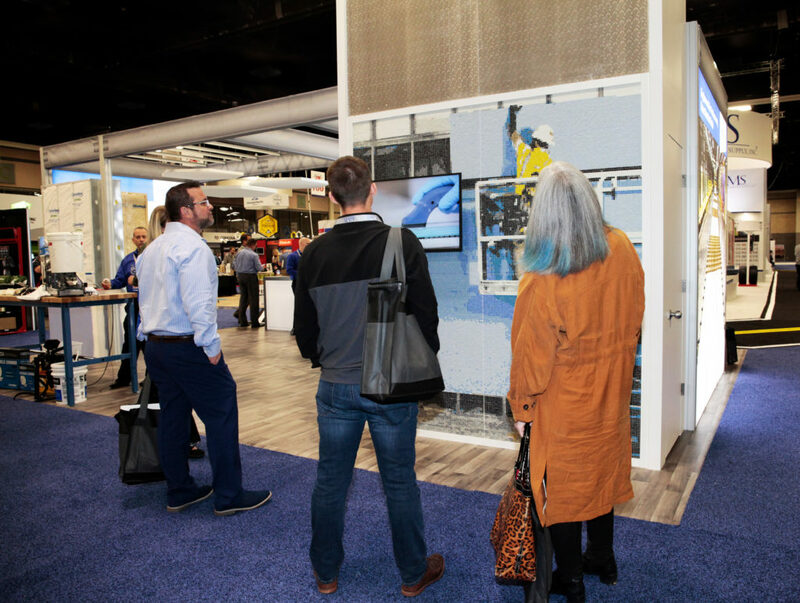 Check out our list of top trade show trends to watch in 2019! 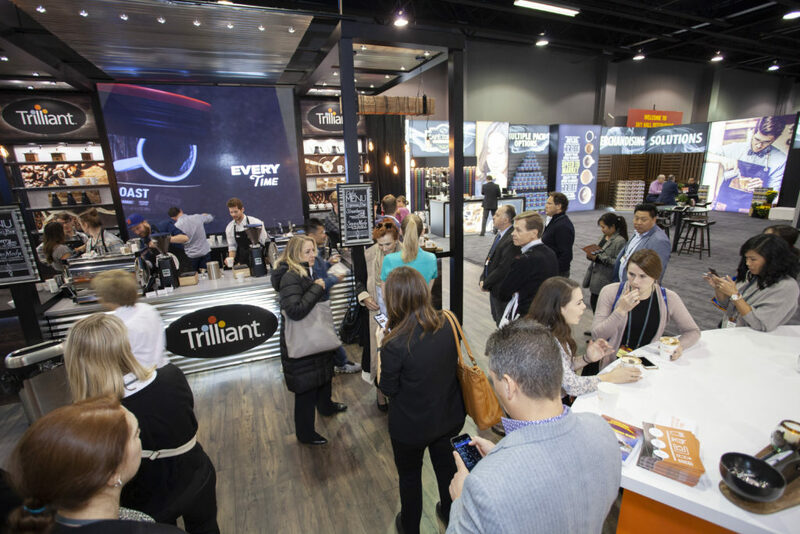 Trilliant’s immersive cafe environment drew a crowd. The heart of face-to-face events is the ability to connect with attendees in a hands-on environment. However, oftentimes exhibit halls can be a sensory overload as many exhibitors compete for attention. Go beyond traditional trade show marketing tactics and create an experience that transports attendees to an immersive branded environment. Trend-savvy exhibitors are rising the challenge of redefining “trade show” to be entertainment focused, rather than simply showing off goods and services. While many exhibitors may rely on the use of technology to boost engagement, booth visitors are drawn to unique offerings such as games, giveaways, demo stations and other hands-on engagement. Nimlok partnered with Trilliant to successfully create an experiential café environment with flawless attention to detail. Live entertainment coupled with a fully-functional coffee bar and cozy seating areas encouraged attendees to take off their coats and stay awhile. The exhibit was a smashing success, drawing quite a crowd for record booth traffic. At Nimlok, there is an increasing demand for exhibits that replicate a showroom feel on the trade show floor. This is a clever trend that allows exhibitors to really showcase their products and services with class and style, transcending the expectations. 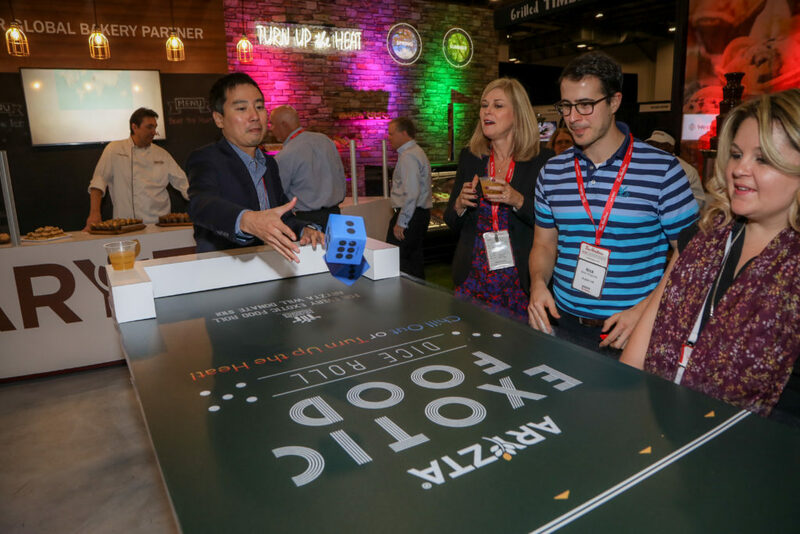 By seamlessly incorporating products into the exhibit’s display elements, you can wow booth visitors by providing a hands-on experience. Depending on your offerings, brainstorm unique ways to build products directly into the exhibit for maximum impact. 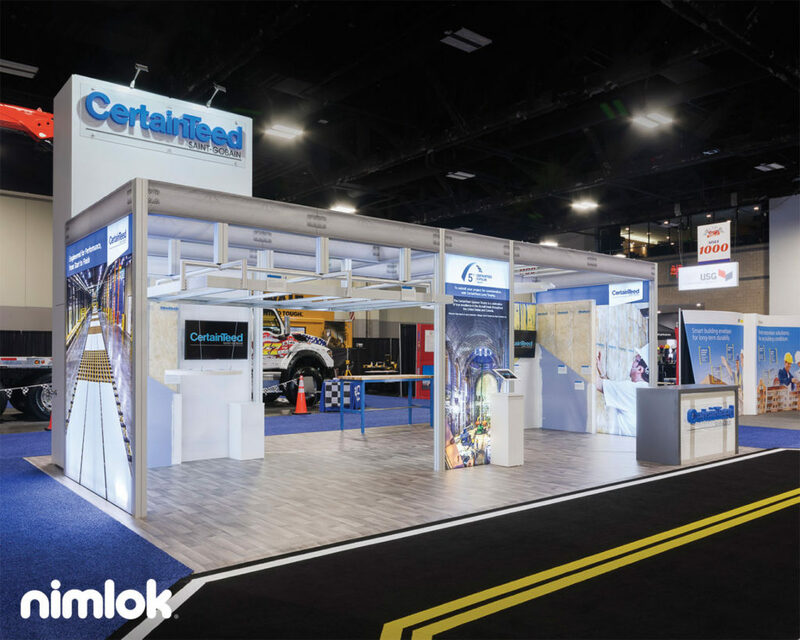 CertainTeed’s impressive 20’ x 20’ exhibit featured their premium insulation and drywall products throughout the exhibit. For a museum-like effect, informational cards called out which materials were being used throughout various parts of the exhibit. This allowed visitors to explore the exhibit and learn about the company on their own terms. The highlight of the exhibit was a ground tower that incorporated a mosaic that utilized the company’s tile backing materials, drawing an impressed crowd. This exhibit features a modern approach to minimalist exhibit design. Minimalism has been in the spotlight, as many consumers are seeking to simplify their lives. This trend is evident on the show floor, as many exhibitors are opting for streamlined exhibits and clutter-free graphics. While it may seem tempting to fit as much information as possible inside the exhibit, often this leaves booth visitors feeling overwhelmed. Consider which messages are the most important for your brand to convey and start from there. Overhead signage is a great way to boost branding without cluttering the exhibit space, and it alerts attendees about your brand’s presence from across the show floor. Utilize the “rule of thirds” design principle and limit your exhibit’s focal point to three main areas, like a demo station, product display and a reception counter. 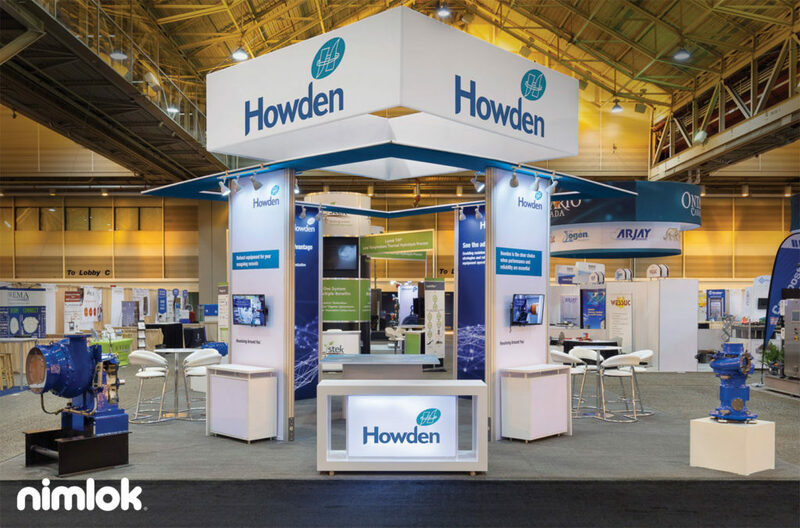 Howden’s 20’ x 20’ island exhibit is a perfect example of minimalist exhibit design, with clean graphics and a simple open-concept floor plan. Interesting pedestal product displays attract attendees from the aisle, while an interior space allows visitors to learn more about the brand. Backlit graphics and track lighting add the finishing touches to this modern and streamlined design that emphasizes the rule of thirds. Visitors were encouraged to participate in a game tied to a charitable contribution. More than ever before, consumers are choosing brands that speak to their core beliefs. Socially conscious exhibitors can easily incorporate their corporate mission statements and values directly into their event marketing campaigns. Choose a cause that aligns with your brand’s identity, whether it’s helping children succeed at school or protecting the forest through environmentally responsible manufacturing practices. There are several ways to promote your brand’s mission statement at trade shows, but it’s important to focus on which messages are most impactful. Whether you choose a sustainable product giveaway or a fundraising in-booth activity, it is important to properly develop a campaign around the booth that will encourage visitor traffic and engagement. A great example of a socially-conscious exhibit is Aryzta’s exciting 40’ x 40’ island exhibit that incorporated a fundraising activity that benefited a children’s foundation. Nimlok Chicago came up with the idea to create a Fear Factor-style game, the Exotic Food Dice Roll to draw attendees into the exhibit. As an incentive for guests to play, Aryzta pledged to donate $10 to a charity for each dice roll made. By the end of the show, attendees allowed Aryzta to fulfill its pledge by donating $10,000! Related: Download the Inspiring & Interactive E-Book to Learn more! When looking to apply some of these trends to your own trade show program, it is important that you evaluate your trade show objectives, buyer personas and industry. It may not make sense to incorporate elements from all four trends, so choose the ones that will have the greatest impact on your audience while helping you achieve your goals. Looking for more trade show tips and expert exhibiting advice? Check out Nimlok’s trade show resource library filled with e-books and guides that will help you exhibit smarter. Jillian Tempestini is Nimlok's Content Marketing Specialist and has over a decade of blogging experience. Jillian is a photography enthusiast, who enjoys hiking as much as she loves hiding inside with a good book and her chihuahua, Arya.